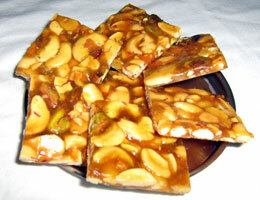 A brittle sweet made of gur (unrefined sugar made from sugar cane) and nuts & dry fruits. 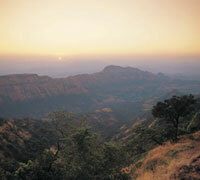 Matheran is famed for its locally produced Honey and Sweets - Chikki, fudges and jelly sweets. One can find these varieties at the chikki marts on MG Road - Nariman Chikki Mart; Janta Chikki; Jolly Fudge & Chikki Mart etc. Masterfully crafted leather footwear, belts and wallets on M G Road can be found in shops like New Prabhat Foot Wear, Tukas Belt House and locally produced oil paintings, cane goods with Kushal Niketan etc. Some of the popular joints that serve good snacks and reasonably priced varied cuisine on M G Road near Market area are Khan's Parkview Restaurant; Rasna Restaurant, Garden View Restaurant; Shangrila Restaurant, Lord's Central Hotel; Pramod Restaurant & Bar; Diwadkar Restaurant & Bar etc. Tourists - The use of any plastic bags and throwing of garbage of any kind is strictly prohibited in Matheran, a declared ecologically sensitive zone by the Govt. of India.